“From Bop to Bach” and a fond farewell to a favorite songbird warm Twin Cities jazz venues this week. Back in November, pianist Laura Caviani revisited some of her classical repertoire, now interpreted through her post-bop experiences as composer and performer. In trio format, she captivated the Artists Quarter audience with her new takes on Bach, Schubert, Chopin, Debussy, McDowell and more. Now she’s back with an expanded program and expanded band, adding vibes master Dave Hagedorn to an ensemble with Chris Bates on bass and Phil Hey on drums, “From Bach to Bop” this weekend, back at the AQ (1/6-7). 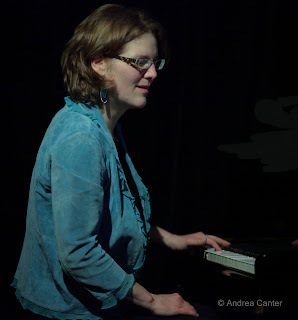 And you can be sure Laura will add works by Monk, Mary Lou Williams, maybe Alec Wilder and Horace Silver? Friday night (1/6), the Black Dog continues its biweekly “Community Pool—Deep End” series curated by Nathan Hanson and Brian Roessler. Tonight’s offering comes from Hanson, Pat O’Keefe, Pat Moriarty, and Davu Seru. Horns a plenty. Across town at the Dakota (1/6), Cuban firebrand Nachito Herrera is back with a night of flaming musical cigars, piano madness and lots of fun. And stick around late (or come downtown!) for the shape of jazz to come, with the Jake Baldwin Sextet on the Late Night schedule. 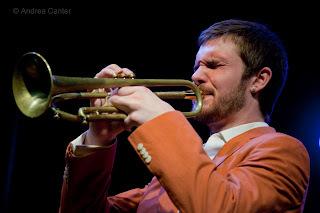 Jake is a prodigious trumpeter in his third year at the New England Conservatory of Music, a finalist in the 2011 International Trumpet Guild Solo Competition and alum of Minnetonka High School, the Dakota Combo and Minnesota Youth Jazz Band. Tonight he gathers some equally outstanding young players studying in college music programs or recently graduated and launching their careers. 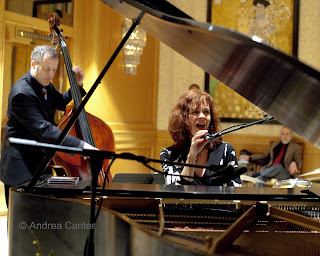 If you are looking for some excellent chamber jazz in an informal but classy context, remember some weekly offerings in both downtowns—the Joann Funk/Jeff Brueske duo in the Lobby Bar of the St Paul Hotel, and the Benny Weinbeck Trio (with Gordy Johnson and usually Phil Hey) at D’Amico Kitchen in the Meridien/Chambers Hotel. This month, catch them on Friday and Saturday nights (1/6-1/7). Nathan Norman fills in for Hey this weekend with Benny. Tuesday night at the Dakota (1/10), the Twin Cities jazz community celebrates the life and music of Christine Rosholt, one of the area’s most popular vocalists who passed away on December 28th. Paying respects will be a long list of musicians, including her frequent cohorts Tanner Taylor, Graydon Peterson, Mac Santiago, Dave Karr, fellow vocalists and more, many of whom appeared on her December release, Pazz. Café Maude has been hosting some fine jazz ensembles lately, and this week is no exception. Peter Schimke, James Buckley and Jay Epstein form an inventive trio on Wednesday night (1/11), and the menu from Maude’s kitchen is a fine complement to improvisation. Things seem a bit slower in January but there’s always several choices on any given night. Visit KBEM’s jazz calendar online for updates.